All Things Bright and Beautiful in Skinner’s September 27 Auctions of American & European Works of Art | Skinner Inc.
BOSTON, MA – Skinner, Inc. presents a notable two-session auction on Wednesday, September 27, in its Boston Gallery. Fine Prints & Photographs starts at 12PM followed by Fine Paintings & Sculpture at 4PM. 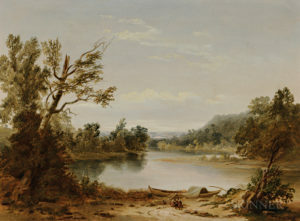 Both auctions contain a broad range of fine works of all kinds, offering something for collectors of all mediums, all tastes, and all budgets. • David Hockney, Caribbean Tea Time, a multipart folding screen. The brilliant color and dynamic, suggestive shapes show the influence of his stage designs and photo collages of the same 1970s-80s time period (Lot 58, Estimated between $75,000-95,000). • Robert Rauschenberg, Publicon-Station IV, a mixed media multiple from 1978. The Publicon series explored Rauschenberg’s interest in the convergence of spiritual and material concerns (Lot 83, $4,000-6,000). 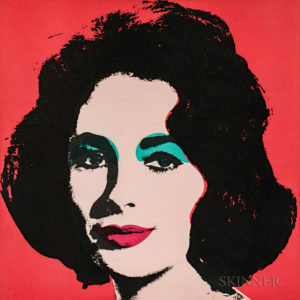 • Andy Warhol, Liz, 1964, an offset color lithograph. Based on a publicity shot for the film Butterfield 8 (Taylor’s first Academy Award performance) it is an iconic image of an iconic celebrity and one of several Warhol works in this auction (Lot 88, $25,000-35,000). Other offerings in a rich assortment of prints are works by artists from Rembrandt to Rouault, as well examples by James Whistler, Bernard Buffet, Joan Miró, Picasso and many others. The photographs section of this auction features a spectrum of offerings, from photography’s beginnings in the 19th century to striking images taken in the last few years. 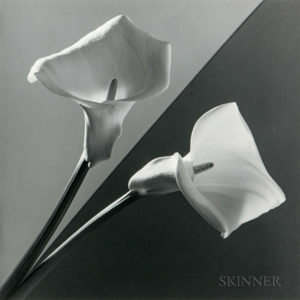 The renowned photographer Robert Mapplethorpe is represented by three serenely classical flower studies, Tulip (Lot 127, $15,000-25,000), Flowers (Lot 128, $15,000-25,000), and Calla Lily (Lot 129, $20,000-30,000). Mapplethorpe’s work is distinguished by its technical mastery and the consistency of his approach, with results that are always elegant, suggestive and challenging in their sensual allure. Another modern master with multiple works on offer is the eminent Brazilian photographer Sebastião Salgado. A photojournalist, Salgado has traveled to more than 120 countries for his photographic projects recording global issues of migration, displacement, working conditions, and the environment. Two of his four works on offer are Site of the Now Dried Lake Faguibine, Mali, 1985 (Lot 137, $5,000-7,000), and Bushman, Botswana, 2008 (Lot 140, $4,000-6,000). Other classic 20th century works include photographs by Harry Callahan, three nudes by Ruth Bernhard, Alfred Eisenstaedt’s harrowing image of workers Repairing the Hull of the Graf Zeppelin During the Flight over the Atlantic, 1934 (Lot 98, $3,000-5,000); and a Yousuf Karsh portrait of the great boxer Muhammad Ali (Lot 120, $5,000-7,000). • Abelardo Morell, Camera Obscura Image of Boston View Looking Southeast in Conference Room (Lot 135, $3,000-5,000). • Washington Allston’s Robbers Fighting with Each Other for the Spoils Over a Murdered Traveler. A leading exponent of the Romantic Movement, Allston was highly regarded for his command of the complex techniques of the Old Masters and his bold use of light and color in depicting his dramatic subject matter in this work dating from 1801 (Lot 250, $70,000-90,000). • John LaFarge, On the Bayou Teche, Louisiana. This rare early landscape with echoes of the Barbizon style is depicted with the same luscious color sense that distinguishes LaFarge’s famous stained glass (Lot 251, $70,000-90,000). • Walter Harrison Cady, a well-known illustrator of magazines, children’s books, and newspapers, depicts a lively group of anglers and their woodland observers in Gone Fishing (Lot 279, $20,000-25,000). • Donald Roller Wilson, living and working in Texas, takes a surreal approach expressed in super-realistic technique, in works such as Patricia, Seeing-eye Dog of Houston (Lot 432, $6,000-8,000). 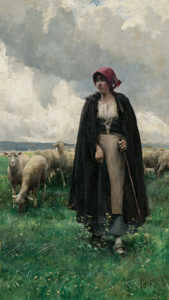 • Julien Dupré, a painter of the French countryside, was widely admired in the late 19th century for his realistic yet lyrical depictions of farm workers in Normandy and Brittany, as in Shepherdess in a Landscape (Lot 230, $12,000-18,000). • Edouard Leon Cortès was a post-impressionist known as “the Parisian poet of painting” for cityscapes like L’Avenue des Champs-Elysées au Crépuscule (Lot 331, $15,000-25,000) and La Porte Saint Martin au Crépuscule (Lot 332, $6,000-8,000). • Eugeniusz Zak, much admired in France and Germany until his early death in 1926. His distinctive style was influenced by his contemporaries Picasso and Modigliani as well as by such Renaissance artists as Botticelli. His unique synthesis is shown in his figural silhouettes such as Young Acrobat (Lot 377, $40,000-60,000). • Tadeusz Kantor, versatile and multifaceted painter, stage designer, actor, and poet, was endlessly inventive and avant-garde in all his work, as in the abstract Untitled (Lot 416, $18,000-22,000). 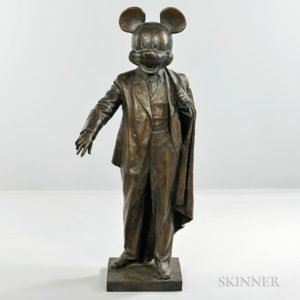 • Alexander Kosolapov, Mickey-Lenin (Lot 434, $25,000-35,000). The artist finds ample material for his social commentary in both Russia and the United States. His “Sots” or socialist pop art works combine iconic figures from each culture into thought-provoking statements like this one, drawing ironic parallels between Soviet communism and American materialism. • Henry Merwin Shrady, in George Washington at Valley Forge, makes a more straightforward comment, in a piece that won the competition for an equestrian statue for the Continental Army Plaza in Brooklyn (Lot 277, $2,000-4,000). • David Hayes, Ritual Object (Lot 410, $700-900). A 1964 bronze by the respected sculptor widely known for his monumental welded steel abstract painted sculpture, this work was part of the Lending Service of the Museum of Modern Art, New York. Hayes was a student and colleague of David Smith and friend of Alexander Calder. This entry was posted in News and tagged Alex Katz, American art, Andy Warhol, art, auction, boston, Contemporary Art, european art, fine art, fine art auction, fine photographs, modern art, Photography, Robert Rauschenberg, skinner, skinner auctions, Walker Evans by Skinner. Bookmark the permalink. Have you seen an oil on canvas painting by John and Mary Young – Hunter of a charming 6 year old boy with his dog, Its’ original silvered wood period frame. The original painting appeared on the cover of Town and Country in 1926. I have the original cover. Assuming the painting could be found, and is in good condition with no repairs needed, it is about 4 feet by 2 1/2 feet with the frame, what would it be worth at auction? The boy is dressed in blue and has light brown hair and a charming face. The painting is not sentimental, but an accurate, beautifully rendered portrait. Thank you for commenting, we are thrilled to hear that you may be considering selling your painting. If you are unable to attend one of our consignment days, what we typically recommend for you to gather information is to submit an inquiry to our Appraisal Department. We will forward your inquiry to our Paintings specialists. Please use our auction evaluation form to send images for evaluation: https://www.skinnerinc.com/selling/sell-at-auction. Thank you!